The CKAS “U” series motion platforms / systems are the best compromise motion systems offered by CKAS Mechatronics and these units are all fully professional, 3DOF electric, high fidelity synergistic motion platforms / systems. These units are the “best value” solution to any motion simulator application - providing more reliability, performance and features than those available on motion system costing many times the price. The key difference between CKAS 3DOF motion platforms / systems and other units on the market, is “design intent”. The CKAS units have been engineered specifically to be used as “Simulators” – not “rides”. This means that our washout algorithms, our controller architecture, and our mechanism design have all been refined to create the highest fidelity possible at an incredible value price point. The CKAS 3DOF design is a "floating centre" architecture, unlike many competitive units on the market which feature a low rigidity "sliding joint" design. The CKAS architecture has been refined heavily to provide the best possible fidelity for a 3DOF motion system. Of course, this doesn’t mean that the CKAS 3DOF motion platform units cannot be used in ride and entertainment applications. On the contrary, these units offer incredible performance / cost ratio, and the resultant customer experience is supreme. 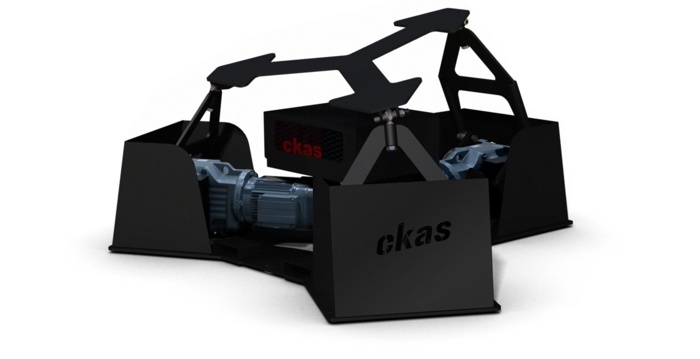 As with all revolutionary products, CKAS are providing more performance, for lower cost, and extremely limited maintenance requirements, making the CKAS 3DOF motion platforms perfect for ANY low to mid fidelity application. As with all our Generation III capable motion systems, the U Series units have real-time Reverse Kinematics, Forward Kinematics and Full featured Washout Cueing Filters all completely "on-board" meaning that any client application can operate these systems at even the "vehicle acceleration" level completely independent of any other software (See Gen III Connectivity Matrix document for more information). If an application is to have excellent performance at a very reasonable price, the CKAS “U” Series 3DOF motion systems are by far the best value alternatives on the market.